Information Governance – Do You Know Where Your Information Is? Please attend this very relative discussion on how to participate or lead managing patient information in your organization. Learn practical steps to take and governance structures used by your colleagues. Do you know about GDRP? And how this new regulatory initiative may affect your organization? 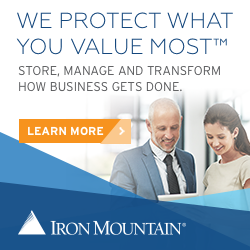 Learn from our session given by our colleagues at Iron Mountain. And do you know what Blockchain is? This emerging frontier may help solve some of the industry’s interoperability challenges. Come learn from our guest expert. We will have coffee/tea and lite refreshments for the morning, followed by our scheduled sessions with a break for a box lunch which is included in the registration. RJ Herrick graduated UConn with degrees in Philosophy and Psychology before the allure of software development landed him in IT. As a 20 veteran of web development and security, his experience in keeping up with cutting edge data exchange systems laid the groundwork for his latest enthusiasm: the cryptocurrency ecosystem, and in particular, Ethereum smart contracts. As lead instructor for DappDevs, a blockchain developer community, he is working to accelerate exploration of the new opportunities afforded by blockchain technologies. When not at the keyboard, RJ enjoys working outside, discussing ethics, and practicing various circus arts. His pronouns are he/him/his. Cindy is the Executive Director responsible for Corporate Health Information Management (HIM), at Yale New Haven Health in New Haven, CT. While at Yale New Haven, Cindy was responsible for the successful implementation of ICD-10, centralizing HIM across the System to New Haven and for developing and overseeing the Information Governance Program at Yale New Haven Health.